Community Arts Preschool offers developmental early childhood programs inspired by Reggio Emilia practices and encourage child centered, play-based learning. Using elements of the Emergent Curriculum and standards adapted from the national Association for the Education of Young Children's Developmental Appropriate Practices, our teachers educate the whole child through integrated curricula where children's emerging ideas and interests play a vital part in our planning. Our programs offer a foundation for meaningful, experiential and creative arts-based learning. Children will experience learning in an inclusive environment – we want children to feel safe learning though making mistakes as well as experiencing the joy in success. Community Arts Preschool has three locations – Civic Park, Heather Farm, and Shadelands. Each program site has its own unique approach and provides a safe, nurturing environment that promotes the social, emotional, intellectual and physical development of each child. 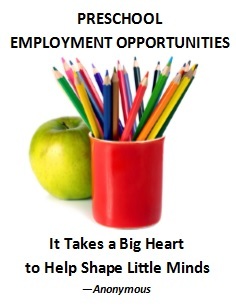 We are seeking substitute teachers with the possibility of more permanent hours in the future for all three locations. Community Arts Preschool is a Center for Community Arts program. For over 40 years the City of Walnut Creek's Center for Community Arts (formerly Civic Arts Education) has been the regional center of arts learning -- promoting new visions, supporting exploration, stimulating creative thought and encouraging self-expression. We bring high-quality visual and performing arts instruction and educational experiences to participants of all ages. Last year more than 16,000 adults, youth and children enjoyed beginning through professional level classes and programs at the Civic Park and Shadelands campuses, as well as at Tice Gym and area schools. Community Arts Preschool is seeking co-teachers for at our Shadelands, Heather Farm, and Civic Park locations. The co-teacher is an important part of our classroom, working closely with our Lead Preschool Teacher to provide support and care for the children in our program. The co-teacher helps with classroom maintenance as well as instruction, assisting students at learning centers throughout the classroom and supervising outdoor play. Prepare snack - double check class list for food allergies, etc.